UPDATE 4: Additional suspects have been identified and charged. UPDATE 3: An arrest has been made – details here. UPDATE 2: Video from the incident has been added at the bottom of this story. UPDATE: Del. Christian Miele has confirmed with police that this incident took place on the parking lot at Perry Hall High School. The school’s video cameras corroborate that there was a melee on school grounds. The photograph shown is a still frame from the video obtained by the Baltimore County Police Department. The incident occurred at about 11 a.m. on Thursday and it did involve at least some current PHHS students. Police are currently working to identify everyone involved. The police believe that the firearm may have been a replica gun, but they are treating it as if it were a real firearm out of abundance of caution and for the purposes of the investigation. Local officials are in an uproar after a Thursday incident at Perry Hall High School. 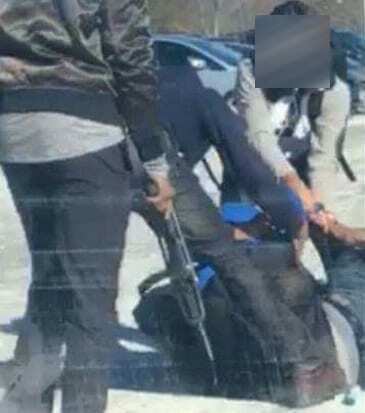 The school has not released specific details surrounding the incident, but reports indicate that a student was beaten on the parking lot Thursday afternoon, a weapon was displayed, and police responded to the scene. Local officials are not satisfied with Perry Hall High School’s response. Baltimore County Public School Board Member Julie Henn also expressed her displeasure on Facebook. “BCPS’ practice of transferring students with disciplinary problems out of their assigned schools and into Perry Hall schools is NOT the solution and CANNOT be allowed to continue,” Henn said. The Perry Hall Improvement Association also weighed in. Neither Perry Hall High School nor the Baltimore County Police Department has released additional details surrounding Thursday’s incident.